Workshops, games, crafts, activities, and a song to explore the underwater world with children. Coloring pages, posters, activity sheets, word flashcards, a picture game, puppets, and crafts to introduce little ones to marine animals. 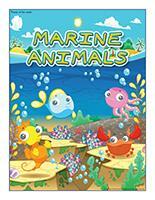 (Open thematic poster-Marine animals) Print, laminate, and decorate the walls of your daycare with all kinds of posters. 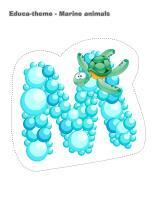 (Open educa-theme-Marine animals) Print and laminate the items that represent the theme. Display them to present your theme to your group (and parents) while decorating an area within your daycare. 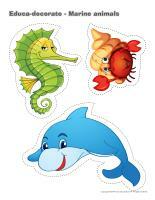 (Open educa-decorate-Marine animals) Print, laminate, and cut out the various items. Use them to decorate your daycare and set the mood for the theme. (Open educa-decorate-Fish) Print, laminate, and cut out the various items. Use them to decorate your daycare and set the mood for the theme. 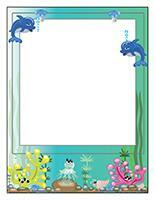 (Open garland-Marine animals) Print the illustrations. Let children decorate them. Cut them out and hang them within your daycare or near your daycare entrance to create a garland. Create a special corner complete with blankets, towels, tables, chairs, clothespins, etc. Offer items children can use to create boats. Use an empty appliance box for the basic structure of a pirate ship and display it on a wall. Use fabric to add sails, empty paper towel rolls to create the mast, etc. (Open pirate ship crew) Print the characters, have children color them, and add them to your décor. This special tool was created in response to a special request received. (Open Group identification-Dolphins) Print and laminate. Use the cards and illustrations to identify children's belongings and decorate your daycare. We have prepared an imaginary game for your group. (Open thematic letter-The ocean) Print the letter. Insert the letter in a bottle and deposit it in a large container filled with water. Deposit the container in one corner of your daycare and let children discover the letter. Read portions of the letter to them each day and complete the suggested activities. (Open picture game-Marine animals) Use the pictures to decorate your daycare or to spark a conversation with your group. Print, laminate, and store the pictures in a Ziploc bag or in your thematic bin. 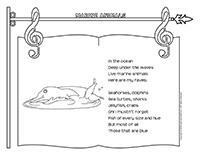 (Open activity sheets-Marine animals) Print and follow instructions. 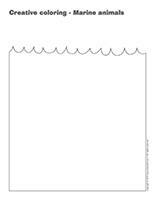 (Open writing activities-L like lobster) (Open writing activities-O like ocean) Print for each child or laminate for use with a dry-erase marker. (Open stationery-Marine animals) Print. Use the stationery to communicate with parents, in your writing corner, or to identify your thematic bins. Have fun with these workshops created by Caroline Allard. Offer only blocks that are blue, brown, and green to represent water, the beach, and seaweed. Figurines that represent marine animals. Deposit a large piece of blue plastic (shower curtain) on the floor in your area. Children will enjoy building structures in the "water". Encourage children to wear mittens to represent crab claws and have them try to manipulate blocks. Add salt to your poster paint and observe the results once children's paintings are dry. You may use sea salt, fine salt, coarse salt, etc. Notice the differences. Add fine sand to your poster paint or white glue. 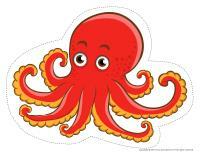 Add construction paper tentacles around the outside of a paper plate to create an octopus. Green, blue, and brown tissue paper, cardboard, and cellophane paper. Group project involving gluing, cutting, painting, etc. to create an ocean scene. Make marine animal puppets and stick Popsicle sticks behind them. Paint using seagull feathers instead of paintbrushes. Provide materials children can use to make their own fishing rods. At the beach: sun hat, beach towels, sunglasses, sandals, sand toys, beach chairs, empty sunscreen bottles, magazines, etc. Deep sea fishing: rubber boots, fishing rods, bait, hats, fishing kit, nets, plastic fish, etc. Diving: diving gear, bathing suits, beach towels, oxygen bottles (2-litre soda bottles), anchor, etc. You may use blue and green electrical tape to delimit your area as well as represent water and the shore. Memory game involving marine animal illustrations. Homemade or store-bought puzzles of beach or ocean scenes. Magical seashells. Use three seashells (or plastic cups). Hide a marble under one of the seashells. Move all three seashells around and have children guess which one the marble is hiding under. Laminate a picture of a dolphin, a crab, or an octopus. Cut it into pieces to create an original puzzle. Provide tongue depressors (to represent crab claws) and pompoms (or pingpong balls) and encourage children to transfer them from one container to another. Play pin the tail on a dolphin or whale. Make your own ocean-themed manipulation bottles. Fill Ziploc bags with blue hair gel, blue salt, blue oil, etc. Seal the bags and use hot glue to prevent leaks. Children will love to manipulate the different substances without getting their hands dirty. Use modeling dough to sculpt marine animals in a variety of colors. CDs with wave or ocean sounds that children can listen to with headphones. Fish and marine animal picture books. Encourage children to invent stories using the illustrations of the educatall picture game. Different activity sheets related to the theme. A cookie sheet filled with sand and a stick that can be used to draw or write in the sand. Laminated fish drawings that children can trace using a dry-erase marker. An obstacle course that children must complete while moving like a sea turtle, a crab, or a lobster. Attach a cushion to each child's back and encourage them to crawl around the daycare like a turtle or a hermit crab. Divide your group into two teams and organize a race. Bowling: Glue pictures of marine animals on ten empty 2-litre soda bottles. Arrange them on the floor to represent bowling pins. Children attempt to make them fall down by rolling a ball towards them. Treasure hunt. 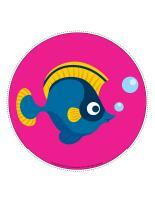 Use ten pairs of brightly-coloured fish and invite children to find the matching fish. During transitions, encourage children to move about like different types of marine animals. Fill a large container with sand and provide sand toys children can use to build sand castles, dig tunnels, etc. Fill a container with pieces of blue ribbon, yarn, and string along with plastic fish and seashells. Make magnetic fishing rods out of wooden sticks, string, and magnets. Stick a paperclip to a variety of items and deposit them in a container. Children will love to "fish" them out. Fill a container with sticky blue substances (Jell-O, baby oil, etc.). Let children manipulate its contents with tiny containers that can be filled and emptied, kitchen utensils, or plastic marine animals. This activity can be a little messy, but children love getting dirty! Make your own wave machines. Have each child bring one empty 2-litre soda bottle from home. Add ½ cup of vegetable oil to each bottle before filling them with water. Let children add a few drops of food coloring before sealing their bottle with the cap. Children will love to shake their bottle to create waves galore. Seashells in different sizes and shapes and magnifying glasses children can use to observe them up close. Manipulation of different types of sandpaper. If possible, bring a live crab or hermit crab to your daycare to give children the chance to observe it. Otherwise, use pictures to present this type of creature to your group. Pictures of land turtles and sea turtles that can be compared. Use blue cellophane paper to observe a variety of items "under water". What does sea water taste like? Prepare a recipe using crab meat or Pollock. Taste (or simply observe) sardines. Use the flashcards to spark a conversation with your group, in your reading and writing corner, or to identify your thematic bins. 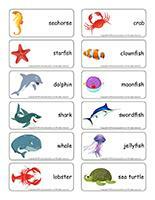 (Open word flashcards-Marine animals) (Open giant word flashcards-Marine animals) Print. 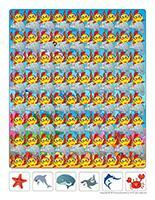 seahorse, starfish, dolphin, shark, whale, lobster, crab, clownfish, moonfish, swordfish, jellyfish, sea turtle (Open word flashcards-Fish) (Open giant word flashcards-Fish) Print. 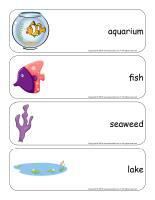 aquarium, fish, seaweed, lake, river, scales, fin, fishing pole, boat, gills, net, hook (Open word flashcards-The ocean) Print. (Open picture clue story-The ocean) Sit in a circle with your group. Begin reading the story. Each time you reach a picture clue, pause and encourage children to guess the missing word. (Open felt board game-The ocean) Glue four pieces of dark blue felt on a large piece of cardboard. Display your felt board on a wall. Print the document. Trace the shapes on colourful pieces of felt and cut them out. The shapes will easily stick on your felt board. 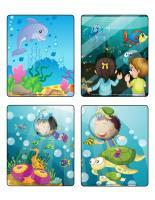 (Open story and memory game-The ocean) Print, cut out, and laminate the illustrations. Place them face down on the floor or on a table. Invite children to pick three cards and invent a story based on the illustrations. Trick: Glue the illustrations to the top of frozen juice cans. Sit in a circle with your group and whisper the name of a marine animal in each child's ear (shark, whale, crab, sea turtle, lobster, starfish, etc.). Stand in the centre of the circle and toss a scarf up into the air while saying, "In the ocean, there are..." Complete the sentence with one of the marine animals. The child who was given this marine animal must rush to capture the scarf before it touches the ground. He must then toss it up in the air, naming a different marine animal. (Open game-This is my spot-Marine animals) Print two copies of each illustration. Use adhesive paper to stick one copy of each illustration on the table. Place the second copy in a bag. Children take turns picking an illustration to determine where they must sit at the table. You may also use the illustrations to determine children's naptime spots or their place in the task train. (Open my marine animal path) Print, laminate, and secure the illustrations on the floor of your daycare to create a path leading to the areas frequently visited by children throughout the day. The path can lead to the bathroom, the cloakroom, etc. If you prefer, use the illustrations to delimit various areas. 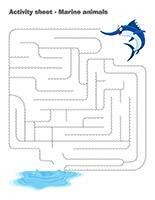 (Open lacing-Marine animals) Print, laminate, and make holes around the contour of each shape. Children can use string or shoelaces to lace the shapes. Blow bubbles galore and encourage children to race to pop them. Select a child who will be the shark. The shark must try to touch one of the other children. When he succeeds, the child who was touched becomes the shark. Variation: The child who is touched must stop moving and hold his arms out to his side. He can be saved if another child runs under his stretched out arms. Several children can have their arms stretched out at the same time. You will have to change sharks often since this activity is quite demanding for little sharks. Divide your group into two teams and have the teams sit facing each other. Have the first group name big marine animals while the second group names small marine animals. Encourage them to use big or small voices (I AM AS BIG AS A WHALE, I am as small as a crab). Sit in a circle with your group. Show them that the port side is on the left, while the starboard side is on the right. Ask children to touch the child on their port side, and then the child on their starboard side. Once they understand both terms, set a row of cones on the right side of your daycare and another row of cones on the left side of your daycare. Have one child stand in the centre. When you shout out, "Port side to starboard side!" children must cross over from the left side to the right side. The child in the centre must try to capture the children as they cross over. Children who are touched must remain in the centre. Continue the game, having children cross over from one side to the other until a single child is left. Children sit in a circle. Have one child walk around the outside of the circle, saying "whale" as he touches each child's head. When he is ready, he says "shark" instead. The child who is touched when he says "shark" must quickly stand up and try to catch the child that touched him before he has the chance to run around the circle and take his spot. If the first child successfully steals the second child's spot, the child who was touched takes his place and walks around the outside of the circle, saying "whale" as he touches each child's head. However, if the child who was touched catches up to the first child before he sits down, the first child must start all over. Use electrical tape to draw two parallel lines on the floor. Set two aluminum plates filled with water between the two lines. Children must cross over from one side to the other without touching the water. If a child touches the water, the other children must shout, "Man overboard!" (Open Models-colourful fish) Print and laminate several copies of this document. For this activity, you will need a parachute or a blanket. Each child must hold one end of the parachute. Deposit laminated fish in the centre of the parachute. When you give the signal, children can move the parachute up and down to represent waves and send the fish flying through the air. Give each child tentacles (pieces of fabric sticking out of their pants). Children must try to steal the other children's tentacles. The first player to collect eight tentacles wins. Organize a race, encouraging children to move about like crabs (with their back towards the ground and on their hands and feet). Arrange jumping ropes on the floor to represent ocean waves. Invite children to walk on the waves to avoid falling in the water. Set exercise mats on the floor and have children crawl all over them as if they were eels. While the exercise mats are out, encourage them to move like other marine animals too. Set three hula hoops on the floor, forming a line (or use three ropes to draw circles). Children form a circle around the hula hoops. Children take turns jumping in the hula hoops to the sound of fast-paced music. When the music stops, if a child is standing in a hula hoop, he must perform a brief "crab dance" before the music starts again. Set a recycling bin filled with water near your daycare entrance. Have each parent write a message for their child and insert it in an empty plastic 2-litre soda bottle before dropping it in the water. At the end of the week, sit down with your group and have each child pick a bottle. Read the messages. (Open educ-trace-Marine animals) Print for each child. Children must trace the dotted lines using a crayon of the corresponding color and then color each object using the same color. (Open educa-symmetry-Marine animals) Print. Children must color the bottom picture to make it look exactly like the top picture. (Open educ-intruder-Marine animals) Print and laminate. Children must find the six (6) intruders. 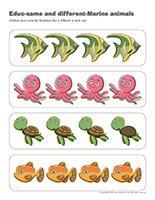 (Open educ-same and different-Marine animals) Print and laminate for durable, eco-friendly use. Children must circle the illustration that is different in each row. (Open bingo-The ocean) Print and laminate. Play bingo with your group. (Open snakes and ladders-The ocean) Print and laminate. Use a die and tiny plastic fish as playing pieces. (Open association game-The ocean) Print and laminate. Children must decide if the fish and marine animals live in the ocean or in an aquarium. (Open hunt and seek-The ocean) Print and laminate. Children pick a card and search for the corresponding item in the scene. You will need a bottle with a cap (empty water bottle, soda bottle, etc.). Pour two cups of water into the container and add a few drops of blue food coloring. Shake the container. Add ½ cup of vegetable oil. The oil will rise to the surface. Add a fish, a plastic boat, and any other tiny objects you may have that represent marine life. Use hot glue to secure the cap and set aside to dry. Gently tip the bottle on its side to create waves. Children will love to see the objects move in the water. Teach children how waves form with this simple experiment. You will need a large shallow container. Fill it halfway with water and give each child a drinking straw. Have them hold the straw close to the surface of the water and blow gently at first, and then much harder if they aren't worried about getting wet! Pour water into several different containers. Provide different ingredients children can use to experiment (salt, sugar, pepper, spices, sand, dirt, flour, etc.). Encourage children to add a small quantity of one of the ingredients to each container to see if it will dissolve. This is the perfect activity for a hot summer day. Gather items that will float along with other items that will sink. Before dropping each item in the water, invite children to guess if it will sink or float. 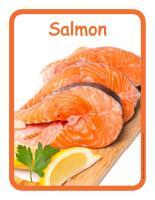 (Open educ-poster-Salmon) Print and laminate the posters to present different forms of this food item to your group. Display them next to the table where children eat or in your kitchen. As a snack, serve fish-shaped crackers (Goldfish) with vegetable juice and pieces of cheese. Let children play with the contents of a container filled with blue Jell-O. Add marine-related items to the bottom of the container. Encourage children to plunge their hands in the Jell-O or use a small net to fish the items out. (Open puppets-Marine animals) Print the models on heavy cardboard. 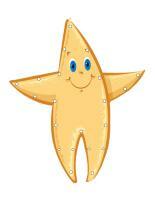 Have children cut them out and decorate them with a variety of materials. Glue a Popsicle stick behind each model to create puppets. (Open models-Marine animals) Print the models and use them for various crafts and activities throughout the theme. (Open My mini turtle) Print, cut out, and color the pieces. Glue them on an empty toilet paper roll to make it look like a turtle. Hang the turtles from the ceiling. (Open mandalas-Marine animals) Print for each child. Encourage children to color the mandalas to relax during the day. Have children build an aquarium using boxes of different sizes. If you wish, you may cut large rectangles out of the sides of a box (to represent the sides of the aquarium). Simply glue blue cellophane paper on them. Hang fish inside the box to personalize your aquarium. Use torn pieces of construction paper to create marine scenes. Do not provide scissors; children must cut the paper using their fingers. 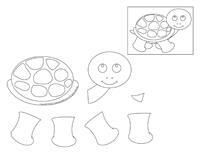 (Open turtle parts) Print the turtle parts for each child or trace the necessary shapes on cardboard. Make sure each child has enough tiny cardboard or foam shapes to completely cover the back of a paper plate. Once this is done, use fasteners to add the turtle's legs and head. You will need sandwich bags (the ones that fold over, not the ones with a zipper closure). Give each child one sandwich bag and encourage them to decorate it using permanent markers (supervision required). When they are done, fill the bags with air and twist them several times. Seal them with a sticker. Cut eight strips of ribbon (different colors) for each child. Have them stick them on their bag to complete their jellyfish. 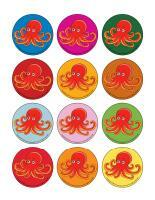 (Open craft-octopus) Print for each child. Have children color the pieces and glue them on an empty toilet paper roll that they previously painted black. (Open craft-crab) Print for each child. Have children color the pieces and glue them on an empty toilet paper roll that they previously painted red. 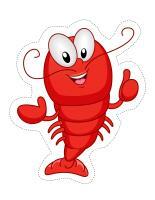 (Open craft-lobster) Print for each child and encourage them to color the pieces. Glue them on construction paper to solidify them and cut them out. Use fasteners to assemble the lobster parts so the claws can be moved. Give each child a piece of heavy paper. Invite them to draw fish, seashells, seaweed, etc. on it using waxed crayons. When they are done, have them paint over their drawing with blue paint (color of water). Their drawing will not disappear since the paint will not adhere to the waxed crayon markings. (Open craft-marine life mobile) Print. Use the shapes as models and trace them on heavy cardboard. Decorate them and cut them out. Use a hole-puncher to make a tiny hole at the top of each shape and thread fishing wire or yarn through them (use different lengths). Hang the shapes from wooden skewers to complete your mobile. Have children draw a simple picture using a wooden pencil. Ask them to apply white glue and press seashells all over their drawing. 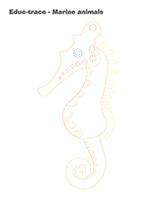 (Open complete the drawing-Marine animals) Print for each child. Have them draw the missing items. 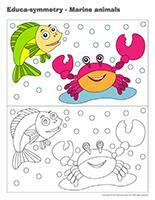 (Open creative coloring-Marine animals) Print for each child. Have them draw what they see at the bottom of the ocean. (Open I am learning to draw-A fish) Print and laminate the model sheet. Invite children to practice their drawing technique on the model sheet and later try to draw a fish on their own. 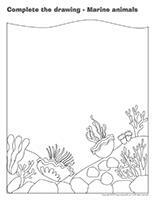 (Open coloring pages theme-Marine animals) Print for each child.